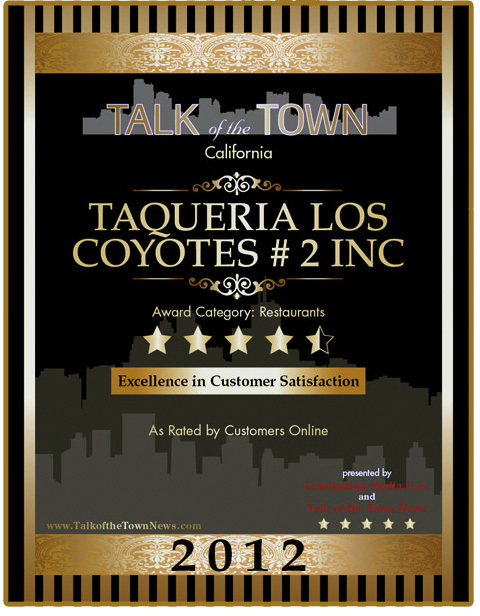 Taqueria Los Coyotes wins high marks from customers for its excellent customer service, garnering it a Talk of the Town Customer Satisfaction Award. Taqueria Los Coyotes opened in 2003 and has been serving the San Francisco community since that time. With a large menu, including breakfast, the restaurant offers everything from burritos and tacos to tostadas, soups and salads. In addition, the restaurant also offers catering services. Taqueria Los Coyotes is located at 3036 16th Street in San Francisco. It is open Monday through Thursday from 9:30 a.m.-10:30 p.m., Friday from 9:30 a.m.-3:30 a.m., Saturday from 9 a.m.-3:30 a.m. and Sunday from 9 a.m.-12 a.m. For more information, call 415-861-3708 or go online to http://www.taquerialoscoyotes.com. If you want to know more about this report, click the images below to see more information.